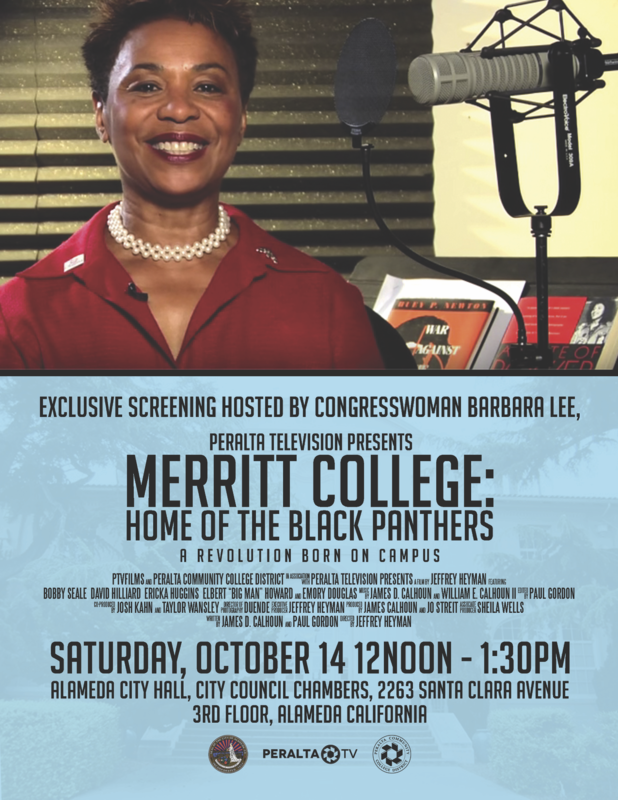 Few know that the Black Panther Party was founded at Merritt College in Oakland in October 1966, and many of its early social justice programs still largely go unrecognized. The television station of the Peralta Community College District, Peralta TV, produced a national award-winning film, “Merritt College: Home of the Black Panthers,” narrated by U. S. Congresswoman Barbara Lee, about the origins of the Black Panther Party at Merritt College. The film, which was shown at the United Nations as part of the International Day of Remembrance of the Victims of Slavery, features rare interviews with Black Panther founder Bobby Seale, as well as members David Hilliard, Ericka Huggins, Elbert ‘Big Man’ Howard, Emory Douglas and Richard Aoki. 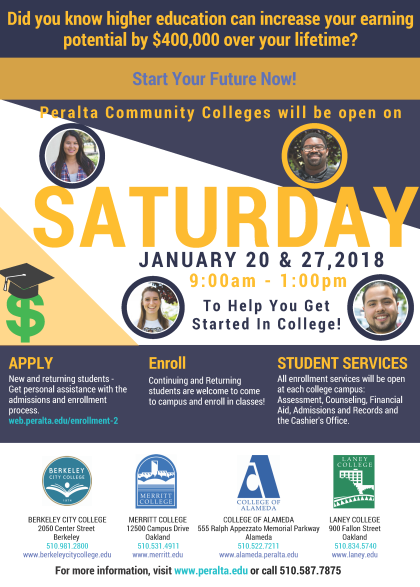 The City of Alameda is happy to partner with the Peralta Colleges in bringing this illuminating film to Alameda. Who: The screening is free and open to the public. 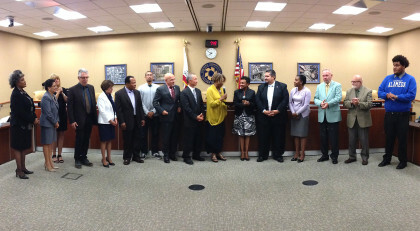 Speakers include U.S. Congresswoman Barbara Lee, Alameda Mayor Trish Herrera Spencer, and the film’s executive producer and director, Jeffrey Heyman, and writer and producer, James Calhoun. At Merritt College, several students from the Puente Program are graduating, including Mariela Salcedo, who will be transferring to UC Davis as a pre-med student. Puente’s mission is to increase the number of underrepresented students who enroll in four-year colleges and universities. Mariela was pursuing a nursing degree until instructors urged her to consider a career as a doctor. Mariela was co-president of Puente Club and a Puente Program Assistant. She would like to create pathways for more female Mexican-American students to get into medicine. Ambitious and compassionate, Mariela will, without a doubt, reach her dream of becoming a top medical doctor. Paul Martinez, one of several graduating students from Merritt College’s Puente Program, made the brave decision to uproot himself from everything that was familiar to him at home in Santa Barbara. Paul, who will be going to UCLA in the fall, moved to Oakland and soon joined the strong, supportive community at Merritt. Paul grew up quite poor and often felt out of place as though the world had forgotten about him. Now, he a writing tutor in the Learning Center and everyone expresses what a pleasure it is to work with him. He is a gentle soul with a great deal of wisdom. Marisela Ochoa, a graduating student from Merritt’s Puente Program, will be transferring to UC Berkeley. As a member of the Puente Club, Marisela is conscious of injustice to workers and has spoken out against low wages for supermarket employees. She is breaking barriers as a Chicana pursuing her own dreams of attaining a higher education. As Coach Brock Drazen reports, the Merritt College Track and Field team had an eventful state championship this past weekend highlighted by Kemarley Brown’s world leading, national community college record 9.93 seconds wind legal time in the 100m race. Kemarley, pictured at this week’s graduation with Coach Brock Drazen, came back an hour later with a win in the 200m (wind aided 20.29) and was named male athlete of the meet when all was said and done. Sometime about 12 hours later, American sprinter Justin Gatlin won a Diamond League 100m race in Shanghai in 9.92 to claim the world lead not before the television crew spoke about Kemarley and his feat from a day earlier. While big news for our program, school, district and in the USA, this is a HUGE story in Jamaica where you may know that track and field is a national past time. Kemarley will return to Jamaica and will participate in his country’s national championship. He has been invited just this morning by Nike to compete in the Prefontaine Classic in Eugene, OR (Track Town USA) in less than two weeks and has been getting nonstop contacts from people around the world. This has been a thrilling ride for all of us and know that our students have handled the focus with great pride, humility and with abundant pleasure. Kemarley’s growth and maturity, physically and mentally has been visible in these past two years and I can assure you that the foundation of his success is a built on the many contributions small and large, subtle and obvious of so many people working at Peralta and at Merritt. Tony Parnell also came up big with a 4th place finish in 10.43, an impressive performance from a hard working, determined guy who trained consistently always with an eye on reaching his maximum potential. By finishing in the top 4, Tony becomes a community college All-American. All 4 members of our 4x100m relay, Parnell, Brown, Tom Jacobs and Rajee Orr were also named All-American after finishing 2nd in the relay at state. It was momentarily disappointing for all of us as we had fended off all community college challengers all season long until this final race (including besting Mt. Sac twice during the season). Nonetheless, we set a season best mark in the race (40.22) and could only congratulate Mt. Sac on achieving their season best mark (40.09) to win the title. I still have to post the 200m race but below are two versions of the 100m and the relay. Overall, Merritt finished 6th at the meet behind two Norcal teams (American River and Sequoias) and three Socal teams (Riverside, Cerritos and Mt. Sac). Defeating the likes of SF City again and realizing that neither Chabot nor DVC had anyone make the state championship is a feather in our recruiting cap–and it’s that time of year. Eight members of the track team are are graduating this year: Tony Parnell, Leo Theus III, Tamba Smith, Aliyah Wilkins, Rajee Orr, Kemarley Brown, Gary Moore and Tom Jacobs (Fall ’14). This will make 32 transferring graduates since 2010.